This is Mary and Joseph’s story. Read it in the Bible. After you’ve watched the video, read the full story in the Bible. Then use the questions to help you think about Mary and Joseph’s story. Click here to download the video of Mary and Joseph’s story. When video screen appears, right click and ‘Save video as…’ (or equivalent) to download. The ‘Mary and Joseph’ story helps us to think about what life must be like for refugees today. Many thousands pf people across the world are struggling to cope living in a place far from home. Leaving family, homes and possessions behind, they travel to a country in search of safety and security. 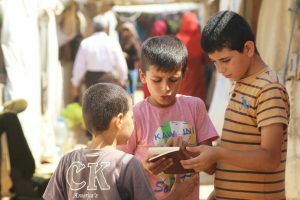 Bible Societies are helping refugees by sharing God’s Word with them. They are providing Scripture materials and aid packages, and resourcing trauma healing sessions and literacy classes. You and your study group can share the Bible with people who need to know God’s message of hope. 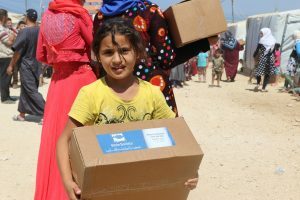 Click here to read about the amazing work happening in refugee camps in Lebanon. 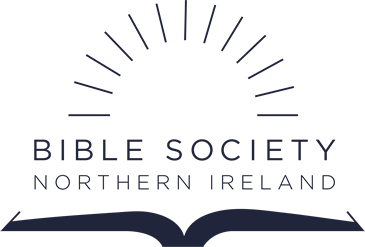 The ‘Story’ project is a joint initiative between Bible Society NI and Play it by Ear. We hope that it encourages you to read the Bible. Perhaps you will discover stories that you didn’t know, or you will be inspired to read a familiar story in a new way. Every couple of months we’ll be sharing a new ‘Story’ video here and on social media. Stay connected to receive our latest updates.